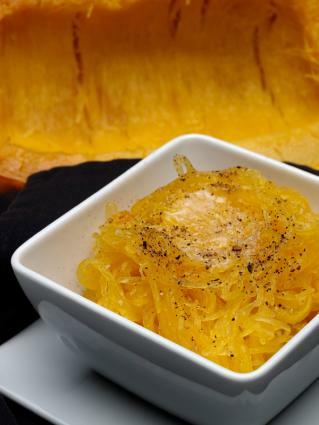 Spaghetti squash is a hard, winter squash that separates into thin strands when cooked. The strands resemble cooked spaghetti, which is where the squash gets its name. To soften the squash, and remove the strands, the squash must first be baked in the oven until it is soft enough to pierce with a fork. Baking your squash this way will separate the strands and allow you to add them to various dishes and recipes. This technique does not flavor or enhance the squash in any way; it merely cooks it. Slice the squash in half lengthwise from top to bottom. Set the two squash halves cut side down on a baking sheet. Pour 1/2 to 3/4 cup of water onto the baking sheet. The water should reach approximately 1/4-inch high on the sheet when you are done. Place the squash in an oven preheated to 350 degrees. Bake uncovered for 40 to 50 minutes, or until the skin of the squash is easily pierced with a fork. Remove the squash from the oven, flip it over and discard the seeds. Use the tines of the fork to scrape down the cooked squash and remove it from the skin. The squash can be eaten as is, or used in another recipe. If you want to increase the sweetness of the squash, try baking it at 400 degrees for the same amount of time. Some of the strands will caramelize, which will bring out additional flavor, perfect if you plan on eating the squash on its own. This recipe takes the cooked strands of the squash, and combines them with cheese, sauce, and spices to make a warm, baked pasta-like dish. Place the cooked squash strands in a large bowl and toss with olive oil until well coated. Rip the basil leaves into small pieces and scatter on the squash. Add the sauce, oregano, garlic, salt and pepper and toss well. Transfer the squash to a baking dish and top with the shredded cheese. Bake at 350 degrees for 15 to 20 minutes, or until the cheese has melted, lightly browned and is bubbling. For a completely new taste, replace the sauce and basil leaves with 1/4 cup of basil pesto and toss well. Add in the other spices and cheese and bake for the same amount of time. Spaghetti squash can be substituted for pasta in most dishes, and works very well in baked pasta dishes. Try baking some spaghetti squash the next time you want a pasta meal or side dish and taste the unique properties of this unusual squash.